Shuraa Management Consultancy LLC licensing services include local sponsorship, economic department licensing fee, company name registration and the entire collection of document clearance services required to complete a new / renew licensing procedure. You have the independence to add any further items to your package, such as a business address for licensing, investor visa processing and serviced office space, PRO Public Relation Officer service, Dubai business setup, Dubai trade license, Dubai offshore company, Dubai trade license renewal, Dubai Free Zone Company and much more. 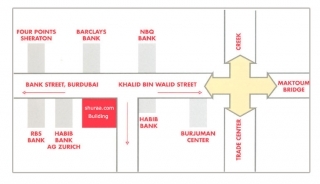 Shuraa Management Consultancy LLC can provide information all about trade License in Dubai and all over UAE. The Trade License in the United Arab Emirates is well equipped with all the amenities, facilities and communication infrastructure required to set up a business. United Arab Emirates is a strategic location for international trade. Since its inception as a federal state the government had opened up the economy for the foreign investors and global traders. 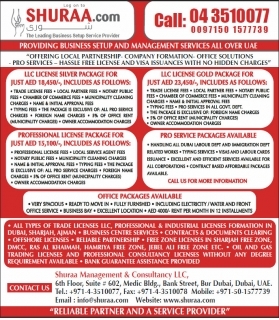 Shuraa Management Consultancy help you to get a new / renew licenses in Dubai Economic Department and Free Trade Zones in Dubai, UAE. Our Services including Dubai LLC Licenses Limited Liability Company License, Professional Licenses, Commercial Licenses, Industrial / Manufacturing Licenses, General Trading Licenses, Public Shareholding Company, Private Shareholding Company, Incentives to Investors in Dubai, Free trade zones, types of license issued In UAE free trade zones, branch of a foreign company and international taxation, special reference to incorporation in UAE free , trade zones and profile of free zones at a glance.